The customer must provide a reasonably level site for assembly of the gazebo. 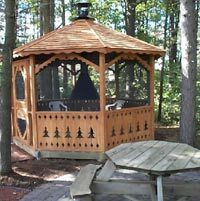 Gazebos can be raised and added to decks. Call for an appointment to have us review your site to determine the price of additional work that may be required for this. Any required permit is the responsibility of the customer. Delivery and assembly is free within a 50 mile radius of Wausau, WI. There is a delivery charge of $2.00 per loaded mile after 50 miles. For prices for out-of-state delivery please call or e-mail.